Every box truck has unique rear door measurements. 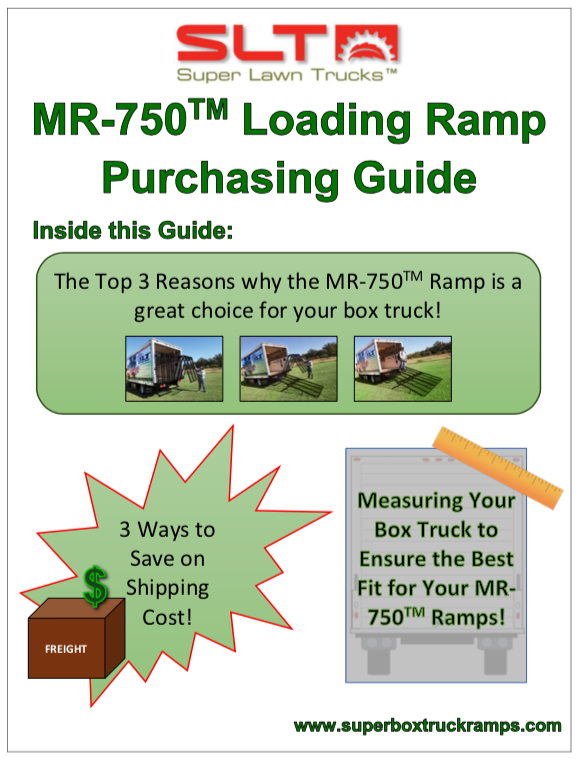 Watch this two part video series and download the MR-750 Purchasing Guide to help answer your questions and learn how to properly measure your box truck before ordering! If you need further assistance, check out the frequently asked questions below or feel free to contact us at 866-923-0027! Here are the answers to the most frequently asked questions we receive about loading ramps for box trucks! How much weight can the MR-750 Ramp support? One ramp is rated for 750 pounds. Place two ramps side by side and distribute the weight across two ramps for a 1500 pound weight capacity. Our ramps have been designed using the latest solid works™ software and FEA Analysis performed to guarantee weight tolerance as advertised. How wide is the MR-750 ramp? We offer three standard widths to choose from: 39.5 inches wide, 43.5 inches wide, and 48 inches wide. We offer custom sizes from 30″ to 48″ wide. Please allow 4 weeks for custom sizes. How long is the MR-750 ramp? The overall length is 10 feet long. This ramp is designed to work with box trucks with a maximum finished floor elevation of 40″ or lower. This creates an angle of inclination between 18 and 21 degrees. What materials are used in construction of the MR-750 loading ramp? The ramps are all-steel construction and powder coated black to deter corrosion. What maintenance is required for the MR-750? The MR-750 is designed to require minimum maintenance. Inspect bolts, hinges, and welds periodically. Tighten bolts or repair as needed. How much does the MR-750 weigh? Approximately 190 pounds per ramp. What is the warranty for the MR-750? Watch this short video to hear about the amazing 90 day guarantee! Guarantee Video-click here! How do you ship the MR-750 Ramp? The MR-750 is shipped fully assembled on a pallet via common carrier. Shipping rates are determined by your location. To get the best shipping rate provide a commercial ship-to address that has a loading dock or fork lift available to unload. Always inspect cargo upon arrival for damage or missing parts. How do I get the best shipping rate? How long does it take to receive the MR-750? We manufacture and stock standard size MR-750 loading ramps. Shipping within the United States takes 2 to 4 days. Special order ramp sizes may take up to four weeks for manufacture and delivery. The MR-750 has a 90 day money-back guarantee. If you decide the ramp will not perform as we have promised in the first 90 days, just return it undamaged, shipping pre-paid, and we will refund your full purchase price. Warranty does not cover shipping costs. How can I order parts for the MR-750 Ramp? Since 1998, Super Lawn Trucks, Inc is an original equipment manufacturer (OEM) and sells parts directly to our customers. Visit our online store or call us at 866-923-0027. All shipments are sent pre-paid. We accept all major credit cards, cash, or check. Can the ramp be mounted in the middle of the truck? The ramps have to be on either side of the truck. Mounting it in the middle requires customization not provided by Super Lawn Trucks. Order a left side or right side model. What is the angle of inclination going into the rear of the truck using your MR-750 loading ramps? The exact angle of inclination will vary according to the distance from floor to the ground. We recommend a maximum floor height of 40 inches from the ground. Expect a ramp angle from 18 to 21 degrees with the floor height between 36 and 40 inches. Are there any pieces of equipment that are not compatible with MR-750 Ramps? We do not recommend using MR-750 Ramps with 3-wheeled mowers or any other piece of 3-wheeled equipment due to the uneven loading and unloading weight distribution. Are there any box trucks that are not compatible with MR-750 Loading Ramps? We have gone through great lengths to make MR-750 Loading Ramps compatible with as many trucks as possible. We do not recommend using the MR-750 ramps with trucks that have over a 40″ ground to floor height. Additionally, U-Haul box trucks require special mounting brackets in order for the MR-750 Loading Ramps to be bolted on without modification to the truck. If you have a U-Haul box truck, special mounting brackets are available for mounting MR-750 ramps on your truck. Lawn business owners are discovering a new way to get an advantage providing mowing services. Box trucks offer 3 to 10 times the lawn equipment storage capacity when compared to pick up trucks. The challenge for box truck owners is loading commercial zero turn mowers, walk behind mowers and stand on mowers is difficult. Pull out ramps were too narrow, too heavy, too steep or too difficult to let out for 10 to 20 stops per day. But loading lawn mowers into box trucks is simple with the MR-750 loading ramps. You’ve found the most affordable bolt-on loading ramp for loading lawn mowers into box trucks. Lawn maintenance contractors discover an often over-looked method to double profits without adding more customers. Get the details here!